In 2008 we met at an event in Malaysia. 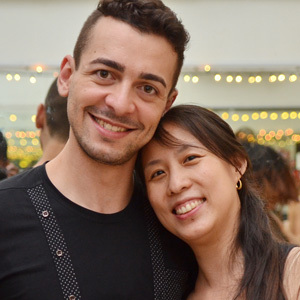 I was teaching a workshop in Brazilian Zouk and they were very interested, so they invited me and my dance partner to come to Singapore to introduce them to this dance. This is where our long term friendship and companionship started. Even thought I was there to teach, I ended up learning so much at the same time. She is a hungry dancer who loves studying everything to the smallest details, and this always resulted in endless hours in training sessions. Since then we have worked many times together and I am very happy to see her growing year by year with amazing students, shows and also producing awesome Brazilian Zouk remixes. Her teaching inspires me because we are both technique fanatics and we have spent many hours, sometimes until late hours, discussing and researching dance and music in order to always be improving and being able to provide the best for our peers. Singapore is very lucky to have such a teacher and friend. She has been and will always inspire many people to become the best they can be, and I am a witness of the change she has made in the people who has come to her classes. Well, I am one of them, and I’m proud to say that I have learnt from her just as much as I have helped her. I had a great experience in my first visit to the Zouk Scene in Singapore. It was for sure a pleasant surprise to see that the scene is so well organized and the dancers value the foundations and good technique, and for that reason are great on the dance floor, regardless their level. Me and my partner had great dances, and despite of not being a huge scene, is for sure growing strong and mature, even more than some older and bigger Brazilian Zouk Communities we’ve been to teach. All these for me are just results of a good leadership. Jean really does a great job teaching, studying researching and educating her students in order to have a healthy, friendly, safe and fun dance environment. This is not a easy thing to do, being so far away from all the other communities, and having to work alone without a partner with whom you can showcase your talent! It all comes down to real effort and passion for what she does, as well as, respect for the dance and culture she’s committed to pass forward! It’s an awesome thing to see! 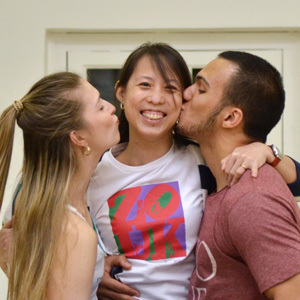 Singapore Zouk community and Jean’s work for sure stole our hearts! 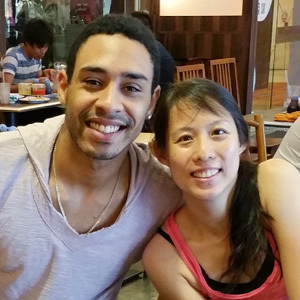 We would like to tell a little bit of our experience in Singapore with Jean Goh and all her dance family. We have been two years in a row there and both of them were amazing. Everybody knows Jean for her dark side humour and to be mean, specially with hers students, which is awesome! They love it, we love it too. Because of that, the level of her students is really good, the foundations are well applied, they are open to learn different techniques and always ask for feedback. They don’t get mad if the feedback is like “You should work more on you basics”. They get motivated and push themselves harder, all of this thanks to the great job Jean have been doing all those years. She is always bringing international teachers to Singapore and she is always doing many privates lessons with them to improve/upgrade her techniques. Jean is one of the most effort teachers that we know, she is a real one, because she doesn’t hold information from her students, she wants them to be better than her, better than the best dancer on the scene! Congratulations for the amazing job you have been doing Jean. We can’t wait to be back to Singapore. We love and miss you all. Hi Zouk dancers in Singapore. I would like to congratulate Jean for the work she has been done on the city and all of the students I have met there, you guys are in really good way. Thank you Jean for really studying zouk and teaching for your students the correct way to dance zouk, I have been traveling around the world and is not easy to find a good dancers and instructors how going to make you dance zouk how should be. My thank you and congratulations for Jean. We are in love with Singapore and the Zouk scene! We are so happy and proud of Jean and her students! 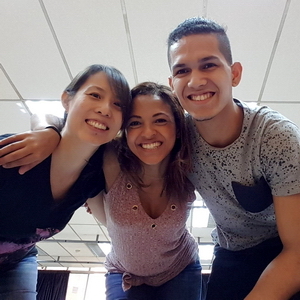 We know the difficulty in bringing International artistes to Singapore… and we can see and feel the effort that Jean puts in, to develop the dance! 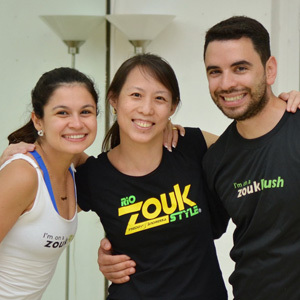 We hope the Zouk in Singapore keeps growing more and more!!!! Thank you so much, for these days in your house. We had sooo much fun! The energy of your house is amazing! Thank u for all the ” dont Chas ” ( Gong Cha) with aloevera , sushis , ricechiken/chikenrice , banana bread and ice cream! We really appreciate ur energy! You became already one really good friend and we gonna miss u so much!!!!! We would like to thank Jean Goh for the beautiful work she has done, in support of Brazilian Zouk in Singapore. We were honored to be invited to a workshop weekend and we were immediately surprised to see the dedication that she has in developing Zouk in her city, and motivating everyone around her to know this enchanting world; she is full of knowledge and empathy for others. Her students are proof that all her effort has been worth it… the guys are really open to the new concepts and extremely dedicated! Congratulations to Jean on her dedication to studying both sides of the dance (leaders and followers), in order to provide the best for her students. 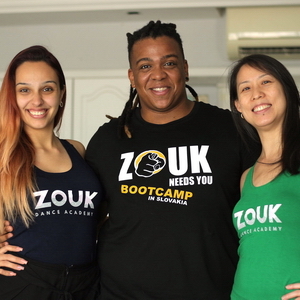 Thank you for advancing Brazilian Zouk, and for making Brazilian teachers feel at home, while they are almost on the other side of the world! I was very impressed by Jean’s work in Singapore. She has managed to put together a great team of lovely, dedicated dancers where everyone gets to learn in a fun atmosphere. As a guest, I was spoilt with a super warm welcome, numerous local dining experiences and a bit of sightseeing both with Jean and her team. I can’t wait to come back, see everyone’s progress and enjoy more fun times with the gang. We would like to thank so much all the Singapore Zoukers for taking care of us, for the good energy and for all the funny dances that we had. It was a very nice and different week for us, full of new good experiences. We love our job and we are grateful for the opportunity to meet a lot of wonderful people like them all over the world.